Here at The Chesterfield Company, we have four different categories for our leathers. These are Full Grain, Antique, Old Vintage Aniline, and Premium Aniline. But what do these names mean? Our cheapest of the types of leather is Full Grain leather. The leathers in this collection are the hardest wearing of our leather categories, so they’re ideal if you have children or pets that are likely to be using the furniture or spilling liquids onto it. Within the Full grain category, there are two collections that we currently offer. One is the Contempo range, which is our most durable leather. This is corrected grain leather, meaning that natural marks and scars that may occur have been removed. Our second Full Grain leather is our Sorrento collection. This collection is different to our Contempo range in that it isn’t corrected grain leather. Our Sorrento leather is classed as a semi-aniline leather, so is a bit less durable than the Contempo leathers, but this means that natural markings on the hide will still be there, which provide a unique look with plenty of character. In the same price range as our Full Grain leather is our Antique leather collection. You will mainly find this option on our Chesterfield sofas, as the leather style suits the classic styling of the sofas. All of the leather colours in our Antique range are classed as Rub Off leather, which means that they are hand rubbed to add a two tone effect, which creates a vintage look that is perfect for our Chesterfield sofas. Next in our collection is the Old Vintage Aniline leather category. This collection is very distressed leather, with lots of character and unique marks and scars from the hide. The category consists of four different ranges-Santa Fe, Vintage, Déjà vu, and Apache. The first three ranges are quite similar, as they all have an element of durability whilst maintaining their natural look, and are treated with wax and oils to give them a soft feel. Our Apache range is a bit different to the other aniline leathers, as this is still fairly durable, but has a softer feel and features a matte finish with a multi-tonal effect. The last of our categories is our most expensive one-Premium Aniline leather. These types of leather feature seven different ranges which all share similar characteristics, although some ranges vary in shine and look. All of our Premium Aniline leather is luxuriously soft to the touch, and provides a stunning range of colours to choose from. Some of our ranges feature a high shine and some rich colours, such as our Jiotto range. Others, like our Selvaggio collection, are still incredibly soft but come with a matte finish whilst keeping the natural look of the hide. Other collections within the Premium Aniline Leather category are known as Pull Up leathers, which means that they still have a high shine, but over time will move and shift with use, which brings out natural tones and colours in the leather, giving your sofa that extra bit of character. Due to the softness of these leathers, they are more susceptible to wear, so are better for homes without children or pets who are likely to damage it. 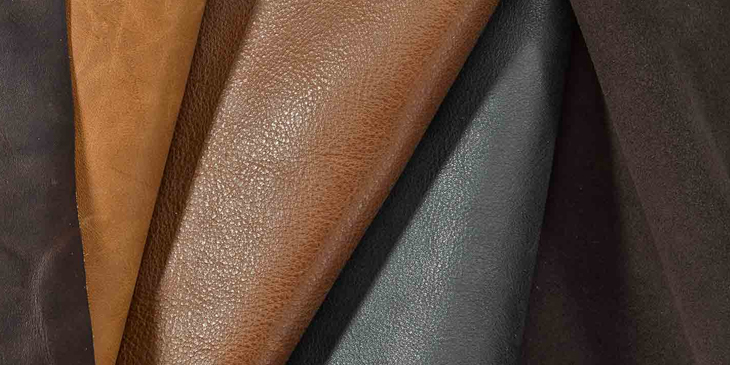 As with all of our leathers, batch variation can occur, and we recommend that you order a swatch from our website or over the phone to truly see the characteristics of each leather range.